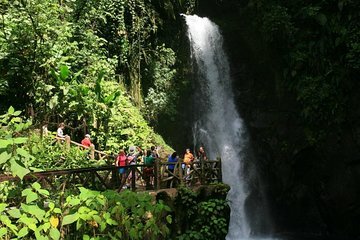 See Costa Rica’s iconic La Paz waterfall during this full-day guided, tour with animal sanctuary visit and an eco-boat ride down the famous Sarapiqui River. Get up close and personal with toucans and monkeys and learn about the five waterfalls, flowers, and rainforest within the sanctuary. Afterward, absorb the biodiversity on a relaxing boat trip down the Sarapiqui river ecosystem surrounded by wildlife in the water and on land.